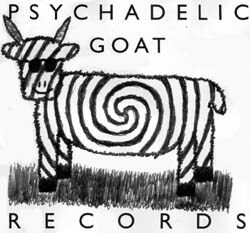 I came up with the idea for Psychadelic Goat Records shortly after I started to write music, I think when I was about fourteen (hence the misspelling of psychedelic, which I’ve kept for sentimental reasons). I really don’t remember how I came up with the name, but I do remember thinking, hey, that sounds really cool. My dream of running my own label became reality in 1999 with the release of my first album, Bridge Over Bottled Water. The funding for the label was pretty much my life savings, with more than a little help from my very generous family since I was only seventeen at the time. Psychadelic Goat is just a vanity label not releasing other artists, and I have no plans to change that policy, as it’s now significantly easier to launch and promote your own record label now than it was when I tried to in 1999. The logo, which got better over the years as my drawing slightly improved (though clearly not very much), is almost exactly what I had envisioned when I came up with the idea for the name. I’m getting closer to being able to photoshop sunglasses and a tie-dye swirl onto a picture of a goat for any future albums, but I’m still not quite there yet. Perhaps I will be by the time I get around to writing enough songs to merit a new album.